General waffling, news and rumours from your mailing list maintainers – Robert Hazelby and Simon Roberts. I know, you’ve been waiting to read this article for a week or so now. Well, now you can!! Alan Redpath explains how the Madquiz works, how to enter, how to supply questions, and most importantly of all, shows us the scores so far. A full review and lyric transcription of the new Suggs single – “I am”, by Alex Ingram. What’s that? There’s a gap in your Madness collection? Log onto the PLR site this minute and see if they have what you’re after. Thanks go to Ashley for typing up this album review of the re-packaged “Divine Madness”. This article was taken from a recent issue of Q magazine. You’re probably read on the list that the Holland Madness concert is a no. Here’s how we came to out conclusion. No, not to overcome some strange illness or phobia, just a hand with his website! News of some excellent un-released Suggs tracks. Article courtesy of Stuart Wright from Nut Inc fanzine. Alex Ingram’s Amiga may have gone belly-up and taken his Madness Amigaguide with it, but Alex isn’t giving up that easily. Perhaps you can give him a hand? Painstakingly typed-in by resident MML subscriber – Suggsylia. Hello and welcome to the August edition of the mailing list Madpost. This issue is slightly different from any of the previous issues which have made it to the list as it’s the first one to be released since Simon Roberts stepped on board as fellow mailing list maintainer. With two of us working on the Madpost it should (fingers crossed!) be larger, more informative, and hopefully should have less errors as well! The mailing list has been running with two list maintainers for almost a month now. From the general feedback Simon and myself have received, it looks like most of you are pleased with what’s been going on. The list has been pretty much argument free over the past four weeks, and the quality of the threads has been brilliant – keep it up! On a more technical side, the list has gone through some slight changes, but 90% of you won’t even notice them. You may remember Simon and myself announcing that the list is now “closed”? Well, what this means is that from now on, should anyone wish to subscribe to the mailing list, they have to go through Simon and myself before-hand. Obviously, 99.999% of people wishing to subscribe will have good intentions, but we have already managed to see off some spam mailers attempting to sell rubbish to the masses. To reduce the risk of any spammers getting hold of your e-mail addresses we’ve also password protected the “who” list which should stop people getting hold of a ready made spamming list! Anyway, enough of the technical talk, lets get back to the interesting stuff – MaDneSs!!! It’s been yet another busy month on and off the mailing list with the famous PLR Madmail finally getting set up on the internet, and thanks to Alan Redpath‘s excellent work, they’re now ready to sell you Madness merchandise at some very competitive prices. Take a look at the site and get completing your collections. I’m sure you can’t have failed to see all the excitement that’s been building up around the impending release of the new Suggs single which is (so I’m reliably informed by you Statesiders!) the title track to the new “Avengers” film. There have been mixed views on the list regarding the new track, some people loathed it, but I have to say that the majority are saying that once you give it a few listens to it really grows on you. One thing’s for sure, it’s likely to do well in the UK charts at least! Hello Maddies- I’ve been told to say a few words for Madpost- I was going to do loads of stuff – but a stinking cold and twelve hour shifts at work have preventing me from the amount of input I would like. (This Benylin stuff is better than beer;) ). Rob says I’ve no excuse- But I haven’t been a maintainer for a whole month yet!! As you all know I’m a co-maintainer with ‘old Robbo’ – we have got our heads together to make the mailing list better, secure and above all, more fun. Now being a maintainer, I understand the pain, grief, sweat and toil it takes to be a maintainer. (applause!- Mr.Hazelby) A lot of what happens may look simple – but a lot of hard work is needed. We have new fresh ideas, competitions, etc.. to keep the list moving, some you may see in this Madpost! One thing is for sure- we wont be staying still! The new MML page is slowly taking shape, (cold/work permitting) and should be up shortly. The new “who’s who” will be up, we have about thirty of you now, please keep sending me those pics!. Someone else on the list has decided to start a similar project – maybe it could work together with the official “who’s who” site via linking.. who knows? Unfortunately my obscure MP3 site will not be part of it! I’m working on begging another 50mb of space fromwork for it- as It cant be part of the official pages for obvious reasons. Stay tuned!! At the moment the list is bigger and madder than ever before- posts are up by 300%– no more slanging matches (as you know what will happen! )- less spam, automated bouncing service, added security to the members, who can now stay anonymous without anybody tapping into the server. Madmeets! I heard someone cry! Camden Madmeets will only be held when something special happens i.e. Madness/Crunch!/Terry Edwards gigs. 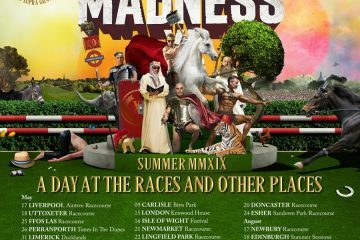 At the moment it looks like no Madness gigs until next year (20 years! they must play Finsbury Park! ‘ Madstock V – The Finale’ ), what with Suggs promoting and soaring up the charts, and tied to WEA. Terry Edwards all-stars looked to be sidelined until another Madness revival in 2006! !, Crunch! is looking favourite for late this year, if Lee Thompson shows interest (Thx- Mole ). The rarest Stiff release is ‘DQMOT’ 12″ Demo– hand written by Suggs I think (For those who are lucky enough to have a copy!) only 500 pressed. The most expensive I’ve seen is � for a 12″ flat black vinyl ONE sided version of ‘Our House’. The most expensive single must be ‘In the City’ Japanese release – changes hands for �- all compared with the measly � book price for ‘DQMOT’ 12″ Demo!! !- again if you know of more expensive stuff- let me know. You’ll probably know that Madstock 4 was filmed by Viacom. I emailed VH1 soon after asking when it was going to be screened, unfortunately they decided to plump for the Guinness Fleadh concert on the Saturday. Also there were rumours that BskyB had bought it for a PPV (pay per view) event-but sky have backed out. I’ve emailed Vh1 (Europe) again asking why they where showing the half-full Finsbury park on the Saturday instead of the 36,000 sell out on the Sunday – they have still not replied. Recently a producer for VH1 joined the mailing list to find out the latest happenings as he was producing a ‘segment’ for a programme. He’s left now. The Fleadh and some another concerts will be on VH1 (Europe) on 23rd August at 18.00. I don’t know If we will get a snippet of Madstock. If you read on you’ll find an article about Huntsham Court Songwriters weekend bash. A pity ‘Big Mike’ Ben Barson didn’t play with Suggs! 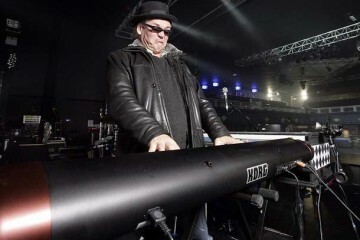 Old Ben hasn’t done too bad- He’s played with likes Kate Bush and Gabrielle, but the most interesting combo must be ‘Clive Langer and the Boxes’ – Clive on Guitar/Vox – Suggs’ wife on vocals, Mr.Ben Barson on keyboards, plus others… Mmmm. sounds interesting but probably crap. Right I’m off- I’ll let Rob get a word in…. I will be asking questions later. I think we’ve waffled on rather too long Simon. I think we should let them get stuck into this month’s Madpost. See you all in the outro (if you make it that far!). 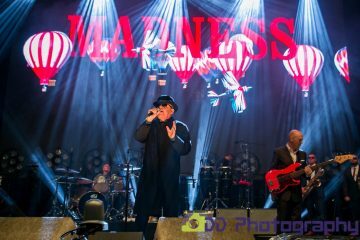 – NEW MADNESS ALBUMS SET FOR RELEASE!!! Well, it’s been exceedingly difficult for Simon and myself keeping this one under wraps. As soon as anything slipped out and we say that we’re keeping the details until the Mapost, World War 3 almost breaks out. Sure, we could have given you all the details before issuing the Madpost to the list, but where would the fun be in that? Besides, you wouldn’t want a Madpost which only contained articles you’d already read now would you?! Ok, don’t get too excited. There are TWO new* releases on the way, but they’re really a set of updates than brand-new items featuring never heard-before material.. I’ll let Mark (Bedford) explain. Thanks for that snippet, Mark! The updated Madness albums are due to be released sometime in September So keep your eyes peeled! There are no prizes for the first person who manages to get hold of these releases, but if you could give us all a review of the new packaging it would be appreciated by one and all. Hello everyone! Rob has asked me to write a short piece about the Mailing List MadQuiz so here goes…. The MadQuiz was started ages ago by mailing list regular Kevin Tizzard and was a popular weekly feature on the mailing list. Towards the end of last year Kevin found he no longer had enough time on his hands to prepare quizzes, mark answers and tend to the general running of the quiz so I offered to step into his shoes and take over the running of the quiz. I ran it for about 8 weeks towards the end of last year and it was becoming quite a popular event but then I decided to pack my bags and set sail from the UK bound for Canada where I’m currently living, because of this I was offline for a few months and the Madquiz was slowly forgotten about…..But now its back….. The Quiz consists of 8 questions per week which must be answered and sent to me no later than 12 midnight EST on the following Thursday. Every 4 weeks a ‘Madbrain of the Month’ is announced, the Madbrain is the person(s) who have the highest total score for the four weeks. As much as I like to think that I know a lot about Madness I still need help from time to time with questions ( and answers! ) I’m always more than happy to receive questions from people to include in the quiz, if you send in a question your name will be up in lights ( well *’s ) on the quiz that your question is used in. The Quiz has now been running again for almost 3 weeks and already there’s a clear leader for the title of Madbrain of the Month…. here’s the scores after two weeks…..
As you can see Mark Bryant has established himself a considerable lead…come on the rest of you…..start sending in your answers! There’s over 200 of you on the list and yet I’m only getting about 10 replies a week! Prizes! Steve Bringe has kindly offered to donate a prize to the Madquiz….I’ll be running a special 4 week MadQuiz once the current 4 week contest is over….I’m sure that will get a few more of you entering! Who knows…..maybe you’ll see more prizes in the near future…..keep Watching your in-box. So, thats the Madquiz summed up in 25 words or less…..if you want to get in touch with me to offer your help with Questions, email me at geordie@interlog.com or if there’s any generous sponsors out there willing to donate prizes for the quiz, get in touch and we’ll try and arrange something…..
I’ll look forward to seeing the answers to the next quiz flooding in…..
 STOP PRESS – IT’S THE NEW SUGGS SINGLE!!! Well I’ve listened to it a few times now, having dashed across my bedroom to hit the record button as soon as the name Suggs tripped out of the DJ’s mouth. I think the song is great – though that might not last with time, it’s certainly an appropriate song for the Avengers title tune. The music is a bizzare Madness-esque mixture of Trumpets and Piano, drums and guitar and keyboard. OK, now to put myself out on a limb – I reckon that the single will peak at number eight. (Simon-) Nahhh! I go for No.1 or 2. There’s a lot of crap in the charts atm. And now, here are the lyrics to Suggs’ new song! PLR MADMAIL – NOW ONLINE! 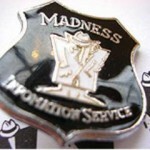 For those of you who dont know, PLRMadmail is a supplier of Madness Music and Memorabilia by Mail order. Up until now you had to send off to them for a catalogue……well the good news is I’ve just completed their website, and now you can browse their catalogue online! They currently have in stock a wide selection of UK and Imported Singles, Albums and CD’s, rare promos, picture discs, flexi discs and more! They also have a great selection of Madness Memorabilia including comics, badges, promo displays, tour merchandise and others. Just read the August edition of “Q” magazine and it has a review of “The Heavy Heavy Hits” so here it is……. YET ANOTHER BEST OF. JUST WHO HASN`T GOT THEIR CLASSICS IN SOME FORM OR OTHER? Twenty-three songs presumably re-packaged to capitalise on this summers inevitable Finsbury Park get-together for festival fun and easy buck-making. The form is the same as ever. Between 1979 and `83, The Nutty Boys had an incredible 17 top 20 hits before their powers began to wane and Uncle Sam and Sweetest Girl failed to make their mark expected of Madness singles. At one time it seemed impossible that a British teenager wouldn’t be able to sing every single word of Suggs’s lines, as Madness covered serious social issues(Embarrassment, Grey day) and simple human emotions (My Girl, It Must Be Love) with absolute assuredness. These songs remain masterful and the lesser tunes are still passable( cheeky git!! ), but without new material or sleeve notes this is an opportunity missed, irrespective of the music’s quality. The article also includes a picture(sorry no scanner!! )taken from about the Mad Not Mad era(no Mike) and includes a sarcastic comment..”Suggs reveals exactly how many copies of Uncle Sam were sold” as he’s holding up five fingers! 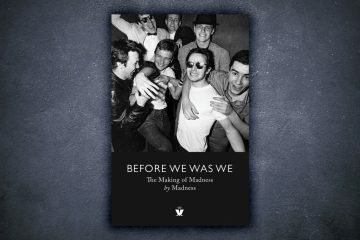 With all these rumours of a Madness concert being held in Holland on 1st August, our mainland European Madddies (and a few based in other countries!) 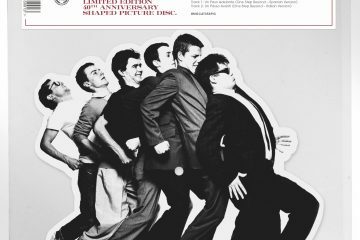 were all running round like headless chickens at the prospect of seeing their beloved Nutty Boys live yet again this year. A quick e-mail from Mark (Bedford) soon got us the information we were after. 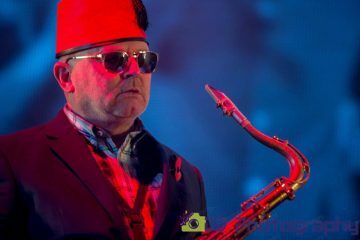 Madness (perhaps not surprisingly) were not planning to play in Holland in August, the band are all off with their families enjoying a much deserved Summer break. In the meantime, Jacco and Luke had also managed to obtain the answer (finally) from the retentive organisers. A Madness cover band from England would be playing, but alas, the original seven wouldn’t. Unpack your bags and hold your horses for Madstock 25! Many thanks to Jacco and Luke for the Sherlock Holmes-style investigation. In the future I’d like to eventually list every Gig Madness have ever done, along with this information I will be listing known audio and video bootlegs for each gig. Also, I’d like to be able to post on my site Reviews and Photos from different gigs. I will give full credit to anyone who helps out with this project. In the autumn of 1996, EMI Records invited renowned artists aligned to their umbrella of record labels to Huntsham Court to flex their muscles for their annual song writing courses. Around fifteen songwriters and performers took part and the line-up was quite impressive to say the least. They included the Mighty Suggs, Chris Difford (of Squeeze), Kirsty McColl, Graham Gouldman (ex – 10CC and writer of classics such as the Yarbirds “For Your Love” and the Hollies “Bus Stop”), the god-like Lamont Dozier (who helped write tons of Tamla Mowtown hits in the sixties) and Ben Barson (Mike’s big brother). Suggs collaborated on five songs with Graham Gouldman and Chris Difford, and sang vocals on three. 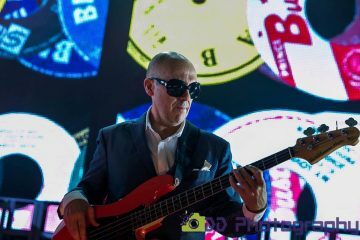 The first track “There Was a Day” features Graham Gouldman on lead vocals and has a very laid-back feel and wouldn’t sound out of place on a 10CC album. “Sad Old Man” follows, and this again features Gouldman on lead vocal with Chris Difford on backing vocals – an acoustic number, almost in the singer/song writer mode of the early seventies. The third number, “That’s The Way we do it” is more like it. 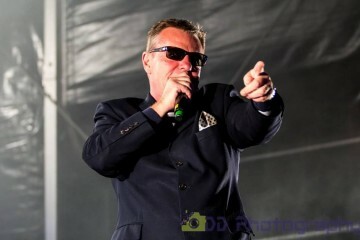 Suggs sings vocals and the tempo and sound isn’t a million miles away from the “Saturday Night, Sunday Morning” track performed by Madness at the Madstock III gig in 1996. Next up is “Me and You Against the World” which again features Suggs on vocal and has a slow reggae beat and some nice lyrics. The final number, for me, the best. “Two Bacon Sandwiches” is a cockney music hall romp in the vein of the Kinks’ “Harry Rag”. Chris Difford supplies backing vocals and the song sounds like exactly what it is; a head-on collision between Madness and Squeeze, with 10CC supplying the acoustic backing. Sadly, these songs will probably remain unreleased or offered to other performers. One or two could turn up though, albeit in a different form, on Suggs’ new album which is pencilled for release in the autumn of `98. Robert and I have been working for some time on a new FAQ for this list, but we found that to keep the size reasonable it was best to keep many items left out. These included a comprehensive lyrics archive, notes on the songs, history and so on. Therefore these will be put onto the web (with a deadline of the end of the year for completion) and so available for all to consult. I aim to include as much as possible, though within some copyright restrictions so copyrighted sounds and pix will be left out along with tab sheets (if I could find them). 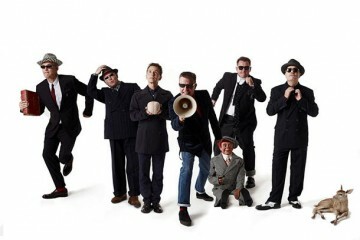 -Details of every gig anyone from Madness has played. -Background info for bios of all members and important figures. -Out of print reviews, interviews and features on/with the band. 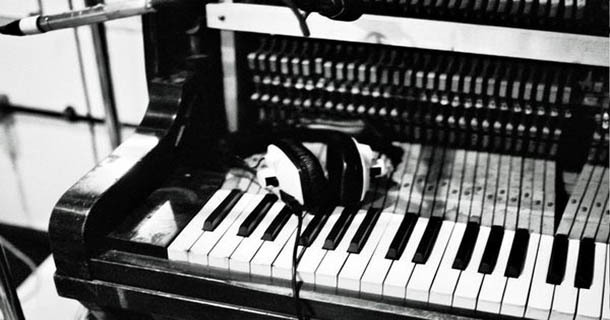 -Behind the scenes info on the music. -Who plays what on each track. -A submission from every web master so that if they answer some questions featured in the FAQ their sites can be accessed via the Mega-FAQ. -Anything you think may also be helpful. -A few recently typed-up articles from the list. -A lousy copy of the lyrics. -Most of the Madness CD’s. Well, here we are again with another snippet from Chris Foreman’s 1982 Diary. No, your eyes do not deceive you, this is indeed the June chunk. Suggsylia has been tanning herself in foreign climates recently so her typing has got a little behind the times. Anyway, enjoy this little snippet as next month we should be having July and August’s Diary. We’re still in Japan. We are doing another Honda advert. For this one we are doing Kung Fu. Also, we are dressed as Arabs. On the 9th we leave Japan. On the 10th we arrive back in London. It’s always quicker on the way back! Meanwhile we were in the Studios again until the 24th when we do a Radio One session for Kid Jensen (30th). Then Lee, Mark and I cycle from Wolverhampton to Worcester, about 30 miles to raise money for charity. We are with the Radio One Road Show and Simon Bates. That night Lee and I stay in Birmingham and go to see Roy Orbison. Have we time for one more? That wraps up the Madpost for this month, hope your stay was a pleasant one!. The next Madpost is going to look different – we are working on a new format. Well August is upon us, and there’s no sign of ‘Mr.Sun’, looks like a miserable summer again for us in the UK. Maybe he’ll be down at Tower records again signing his new single, no doubt some of us may pop down to Camden!!. If you have ideas or any articles you would like to be included in the Madpost, just let us know. The Madpost is the only mail that reaches the outside world via the Internet. Many thanks to all the contributors for making the time.